What does "diesel inspired..." imply? Is this inherently stronger/more durable? The 2.7L piston has the bowl design, but doesn't look too meaty. Last edited by Danno; 04/13/18 02:35 PM. The 2.7L EBV6 is basically a diesel engine at heart with a CGI block. Offset con rods help with offsetting the impact of combustion energy hypothetically - the rod bearings would have less stress especially coming from TDC. The piston bowl design helps with optimizing how fuel burns in the combustion chamber - I think having a richer mixture near the spark plug helps mitigate knock. It should be said though, bigger diesel engines use Mahle's Monotherm piston that doesn't use a skirt like a regular piston does. Last edited by nthach; 04/13/18 02:41 PM. Is this worn rusty prop really part of a promotional display at a Ford dealer? Who comes up with this stuff? It probably helps sell more Chevrolets. Right there. I mean, at least apply some rust dissolver gel & clean er up a bit. Shine it maybe. Last edited by oil_film_movies; 04/13/18 02:48 PM. "Diesel Inspired Piston" heh well it is just a GDI-converted PSA DT17 Diesel engine! 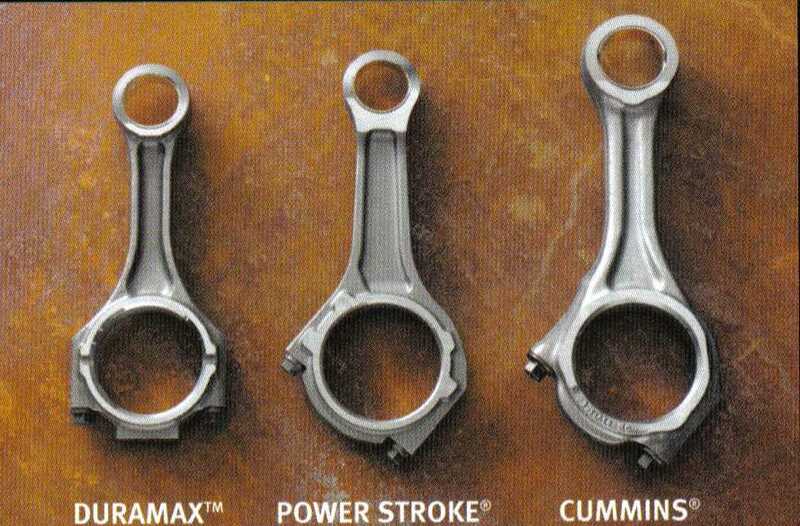 What they must be talking about regarding the piston specifically is the top compression rings; notice the steel band insert cast into the aluminum? Almost looks like there's one for the second compression ring too, but that appears to be a machined bevel and/or treatment of the aluminum. Top ring steel insert is for sure though. NA and turbo Skyactiv engines have the same thing, that's how I discovered about this feature winding up in gasoline engines. Long ago, at a Ford tractor dealership I saw a similar display of a hefty-looking rod from Ford's then-new 3-cylinder gasoline engine, alongside a comparatively scrawny rod from a competitor's comparable 4-cylinder tractor. So, it must be a long tradition of Ford dealers. My wife has the 3.5 Ecoboost in a F150 and RPM-wise its runs like a diesel. Our drive into town is about an hr and highest speed is 55-60mph and the tach NEVER goes over 1500 rpm. There is plenty of low-end torque from 1200-1500 rpm to comfortable push this truck down the road, just like a diesel. The 2.7-L is based on an all-new V6 architecture; it's not part of the 3.5-L family. Bore and stroke dimensions are a "square" 83 x 83-mm. Bore spacing is 95 mm/3.74 in, and the cylinder bank offset is 35 mm/1.38 in. The dohc, four-valves-per-cylinder engine employs twin-independent continuously-variable valve timing (TI-CVT), with the phasers operating in a range of over 30�. Ford is able to use TI-CVT to eliminate the need for an exhaust gas recirculation (EGR) valve. Compresson ratio is 10:1. The linerless cylinder block is compacted graphite iron (CGI), Ford's first application of this material in a gasoline engine. Proven on the latest generation diesels and some racing engines, CGI is a high-strength material with excellent heat transfer properties. Compared with grey iron, the CGI cylinder block offers approximately 75% higher tensile strength, 45% greater stiffness and roughly double the fatigue strength, with excellent dimensional stability, durability, and NVH damping characteristics, according to Ed Waszczenko, Ford's V-Engine Design Leader. 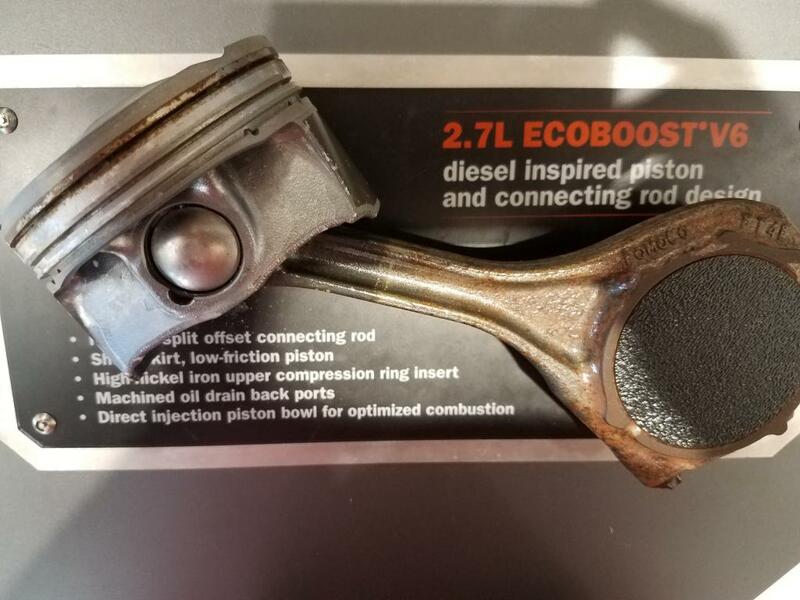 He noted that Ford also used CGI in the 6.7-L Power Stroke V8 diesel (which influenced the design of the 2.7-L's block, offset I-beam connecting rods, reinforced-plastic oil pan, and pistons) as well as in the 2.7-L light-duty diesel co-developed by Ford and PSA for European applications. CGI's strength properties allow for thinner-section cylinder block walls and narrower main bearing saddles. The CGI block is actually one of two main structural elements of the new V6's lower end. The other main element is a die-cast aluminum ladder frame which envelops the lower portion of the CGI element and bolts to thick flanges on each side of the cylinder block. Heavily ribbed on its exterior for added rigidity, the ladder frame also supports the precision-fractured main bearing caps. The bearing caps, also in CGI, are laser-etched at an angle, Waszczenko explained. The specific angle creates a wedge effect that when the sections are merely set together, the engine actually would be able to run without the cap bolts. The small (top) end of the con rod does not contain a piston pin bushing. Instead, the rod's pin bore is slightly convex, to allow for flexing of the pin, and is silicone-coated. Eliminating the bushing permits a slight reduction (3.0 mm) in deck height of the engine, which is 218.3 mm (8.60 in). The exhaust manifolds are cast integrally with the cylinder heads, which produces a compact overall structure and improves heat transfer�necessary for fast catalyst light-off. At the front, the accessory drive pulleys are mounted to a single, rigid aluminum casting. The cooling system is a reverse-flow: Once the thermostat opens, the coolant flows from the pump through both the heads and the exhaust manifolds, and then down and through the block. http://articles.sae.org/13388/ CGI cylinder block in aluminum structure: The small (top) end of the con rod does not contain a piston pin bushing. Instead, the rod's pin bore is slightly convex, to allow for flexing of the pin, and is silicone-coated. Silicone is a polymer lubricant or plastic material. A wrist pin with no bushing would need a silicon (no "e" on the end) carbide coated surface. todays DI allows gas turbo engines to make more cylinder pressure sooner without pinging + thats generally on cheap gas!! get a look what a tune can do for a VAG engine @ goapr using 91 or 93 octane!! I have the larger 3.0 twin turbo version of this motor in my new Lincoln MKZ it develops 400 HP and 400 Foot pounds of torque and is a hoot to drive! It's quiet and civilized when just putting along but drop your right foot and it's just an animal!